Lean Six Sigma Foundation and Best Practices | Data Analysis & Results, Inc. Learn the Fundamentals of Lean Six Sigma for practical, real world project use. Discover how to identify candidates and plan for Lean6σ projects in your organization to reduce cost and increase productivity.Lean and Six Sigma methodologies (Lean6σ) have been around since the late 1980’s. Even so, many of us have little experience applying Lean6σ within a project management structure or within our organization. This course will provide you with an understanding of Lean6σ basics and the value they bring to the right type of projects. You will gain a vision for how to choose productive projects to apply Lean6σ. 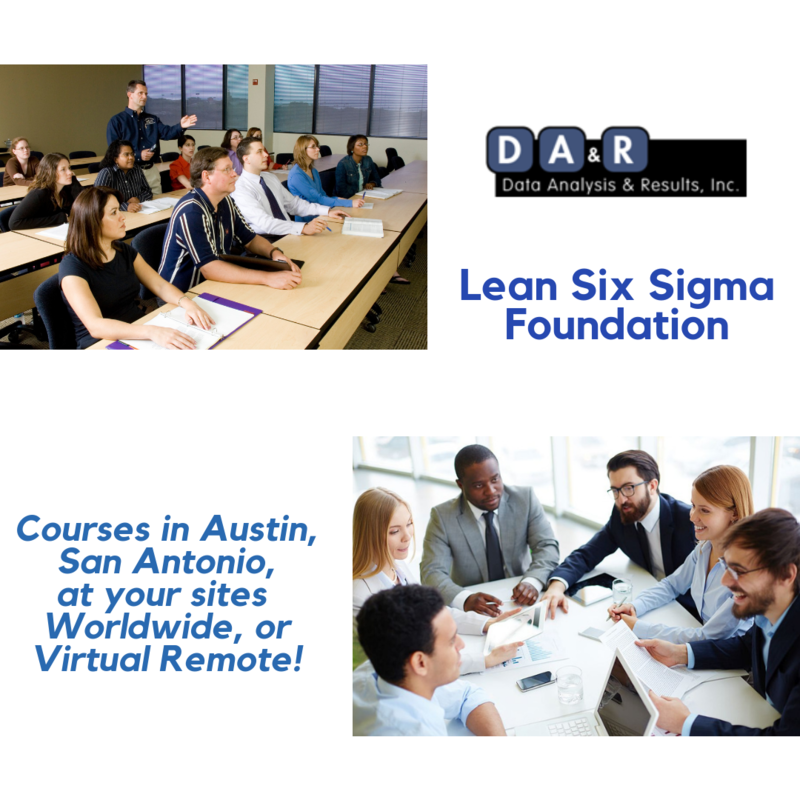 This course is designed for those considering Lean6σ projects future Lean6σ team members, managers who provide staff for or are otherwise affected by Lean6σ projects, and anyone wishing more understanding of Lean, Six Sigma, and how to apply these concepts via powerful process improvement projects. 2-days Instructor Led at our Site, your Site(s), or Virtual Remote. This course and all DA&R courses can be delivered Virtually in any time zone for consistency for your world-wide Learners. Are you looking for ways to improve your firm, nonprofit, or government agency? DA&R can help your organization excel with this course or a blend for a customized training program including Agile, Project Management, Business Analysis, and Leadership Learning. We offer flexible and tailored solutions. See our world-wide client list! Contact Us or 1-512-850-4402 or Info@DataAnalysis.com to determine contents for your onsite, Customized Course Program to fit your organization. College degree, or 1+ years of professional experience in commercial, government, or nonprofit organizations, or our Project Management Foundation course or similar. Discover Lean6σ techniques to process improvement, integration, and new product projects. Learn the common language and terms of Lean6σ learning areas, projects, and professionals. Learn the basics of DMAIC Define, Measure, Analyze, Improve, Control methodology. Assess if Six Sigma and Lean processes are a fit for your organization. Understand the various Lean, 6σ, and Lean6σ designations such as ‘Green Belt’, ‘Black Belt’. Refresh your basic statistics and process improvement skills without the full effort of certification. Understand where Lean6σ may yield increased revenue or decrease product and service expenses. Learn how to work with Lean6σ staff, consultants, and vendors and key Lean6σ roles. Find if Lean6σ Green Belt or Black Belt training is right for you or your organization. Be awarded PMI® Approved PDUs, IIBA® Approved CDUs, and other continuing education credits. Contact Us to discuss customizing for your staff. We share in your success! Our courses are consistently rated excellent, as are our very experienced Consultant Instructors, who average 20+ years of performing on projects, operations, and as many types of leaders. For organizations, we can support your projects and change efforts via Consulting, Speaking, and Staffing. For individuals, we provide advice and some job placement help if you are seeking employment. Here is a summary of some of our services, testimonials, and upcoming open enrollment professional education training courses. We train and consult in 25+ countries. Our consultants don’t just communicate information. They include best practices to encourage learners to assess a situation, use data analysis, collaborate, take the right actions, and make appropriate decisions to drive real results. All courses may include multiple on-site and virtual live instructors to maximize Learner experience, flexibility, and points of view. Agile & Integrated (A&I), WEDIAKPO2!, and DA&R are trademarks of Data Analysis & Results, Inc.